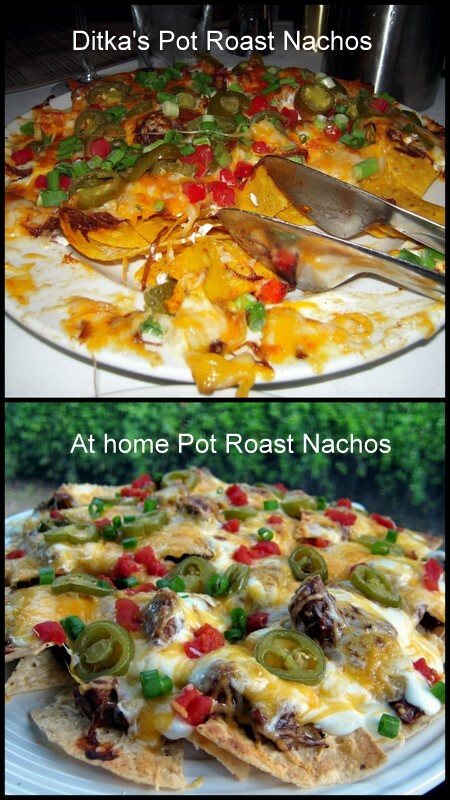 Pot Roast Nachos Recipe - use leftover pot roast to make amazing baked nachos! Pot roast, bbq sauce, chipotles, tortilla chips, cheese, sour cream, jalapeños, tomatoes and green onions. Copycat recipe from Ditka's in Chicago. Chicago is one of our favorite vacation destinations. We love all the shopping, museums, sports and restaurants. One of our first stops when we arrive in Chicago is Ditka’s restaurant. Ditka’s is not your typical sports celebrity restaurant; it is a nice steakhouse. They have a wide range of food and they even bottle their own wine. I researched Ditka’s before our first trip and found plenty of great reviews. I read a lot about the Coach’s Pot Roast Nachos. I am not a pot roast fan, but we had to give the nachos a try after all the great reviews. The nachos are unbelievable! The menu says the nachos are for two people, but this could feed at least 4 with no problem. I finally got around to recreating da Coach’s Nachos at home, and they were as good as they were at Ditka’s. I used our favorite Italian Pot Roast as the base of the recipe. We ate the pot roast one night and used the leftovers for the nachos. I added some spicy BBQ sauce and chipotles to the meat as I reheated it. I added all toppings from Ditka’s – sour cream, scallions, cheddar and jack cheese, jalapenos and tomatoes. It was almost exactly the same! Eating these nachos really made me want to take a trip to Chicago. If you do get the chance to visit Ditka’s in Chicago, sit upstairs in the bar area. Da Coach is up there sometimes (I’ve seen him once), and they have a guy singing Sinatra tunes on the weekend (he sounds just like him). It is a really fun place and the food is fantastic! As part of the Tastemaker Program at Foodbuzz.com I was sent a sample of the new KC Masterpiece Southern Style BBQ sauce. It arrived the night before I planned on making these nachos- a.k.a. perfect timing! The sauce is thinner than most bottled BBQ sauces - I really liked that. It is also pretty spicy! It has cider vinegar and both red and black pepper in it. We loved it. It was perfect for our Pot Roast Nachos. I am planning on slow cooking a pork roast in it soon. In a medium saucepan, reheat the pot roast with the BBQ sauce and chipotle peppers. Place tortilla chips in a single layer around a large, round oven-proof dinner plate. Using tongs, spread the saucy meat around the tortilla chips. Squeeze out sour cream in a crisscross pattern over chips and meat(I used a sandwich bag and cut the tip off the edge of the bag). Sprinkle cheese over the chips evenly to the rim. Top with jalapeno slices and diced tomatoes. Toast in 500ºF oven until cheese is melted completely (should toast quickly). Garnish with scallions. This looks incredible! thanks for sharing! reminds me of Cocina Superior's brisket quesadillas in a way!! Can't wait to make this!! I should NOT have read this on an empty stomach. Now, I've GOT to have some nachos!! MNmMMMmMmm looks delish! Can't wait to try it. This looks AMAZING! I've printed out both recipes and can't wait to make both of them. Thanks for sharing. I'm sitting at Starbuck's and just considered leaving all my stuff to go 2 doors down to Moe's to stuff my face with nachos. Although yours look more delectable. Can you suggest a substitute for the KC Masterpiece Southern Style (probably doesn't exist anymore)? What sort of seasoning should I be looking for? Any BBQ sauce will work just fine. Pick your favorite. Enjoy!